To maintain engagement with supporters and friends, the Spannocchia Foundation has published a newsletter twice a year for the past decade. Featuring a gorgeous design by VP Creative Rebecca Morse with rich visual and written content, La Notizia brings the 1,100 acre organic agricultural estate near Siena, Italy to life. In 2013, in an effort to reduce paper usage and postage, Spannocchia opted to send the newsletter electronically as a PDF. The PDF version of the newsletter was just as beautiful as the printed version, but required recipients to open the file – not exactly user friendly. There was also no way to track how many people actually opened the PDF. 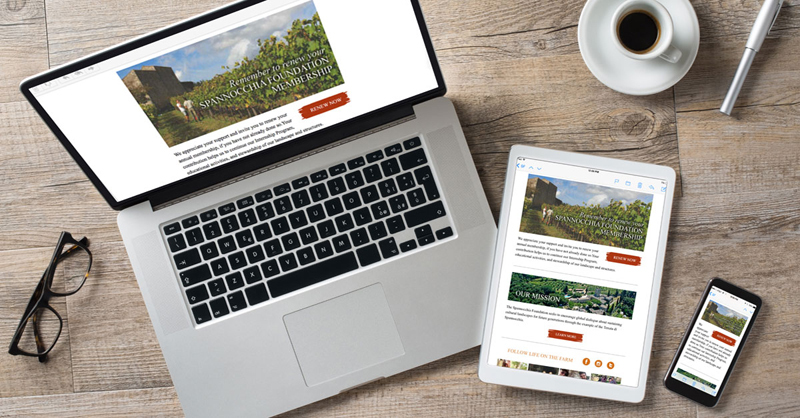 This spring we optimized user experience and took engagement up a notch with a “snackable” and clickable email template that encourages readers to visit Spannocchia’s website to read more on the blog, renew membership, browse education programs and connect on social media. The new design looks great across all devices – mobile, tablet, desktop. Best of all, it’s measureable. The optimized eNewsletter delivered open and click rates that far exceeded non-profit industry averages. Best of all, visits to the site increased 176% compared to the day the 2014 newsletter was sent.